Potential energy is the energy you can get from letting something move. For gravity if you drop something you can convert Potential Energy to Kinetic. The energy you get is approximately the force times the distance (yes that is similar to work). 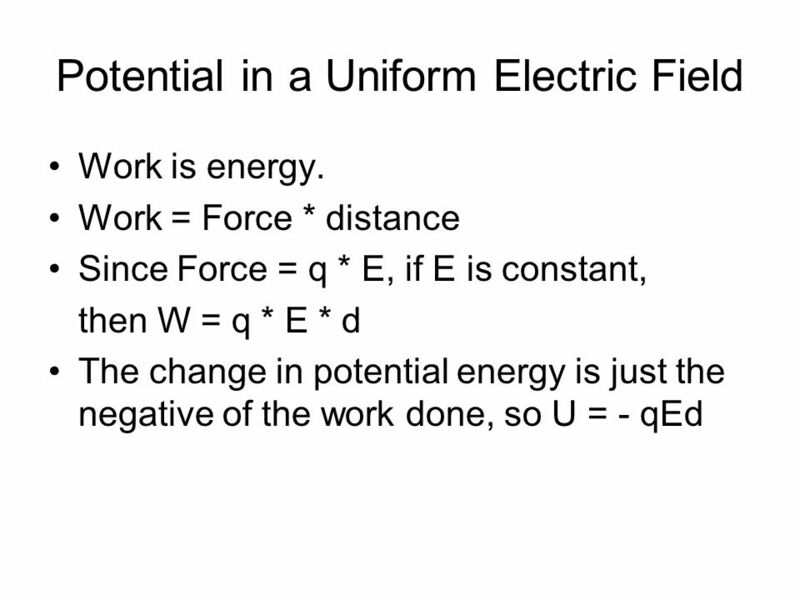 Electric Potential energy is the same. It is the potential energy between any two charges. 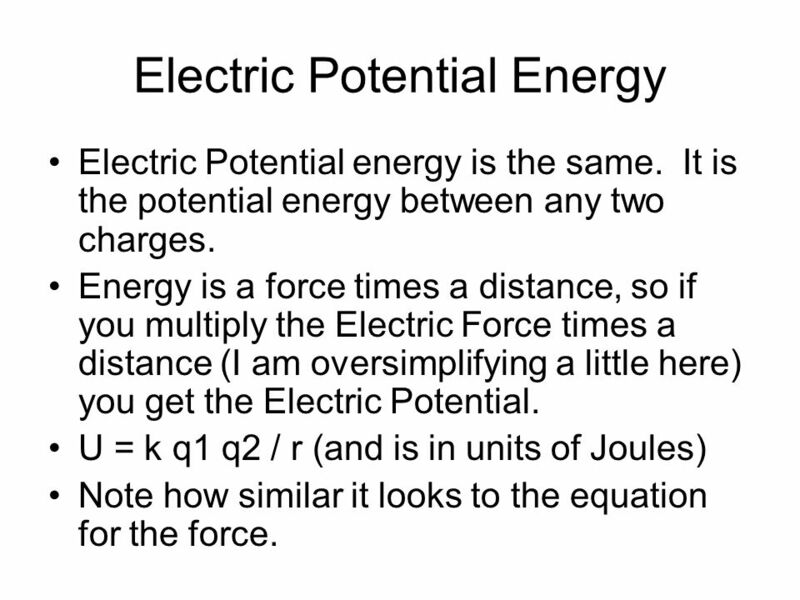 Energy is a force times a distance, so if you multiply the Electric Force times a distance (I am oversimplifying a little here) you get the Electric Potential. U = k q1 q2 / r (and is in units of Joules) Note how similar it looks to the equation for the force. 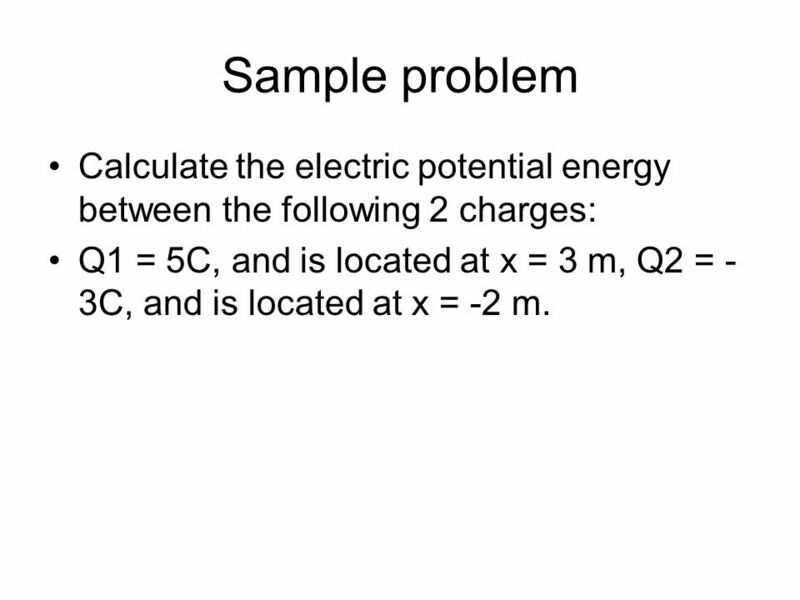 4 Sample problem Calculate the electric potential energy between the following 2 charges: Q1 = 5C, and is located at x = 3 m, Q2 = -3C, and is located at x = -2 m.
5 Negative energy? The negative because it is attractive. Therefore it TAKES energy to separate them. 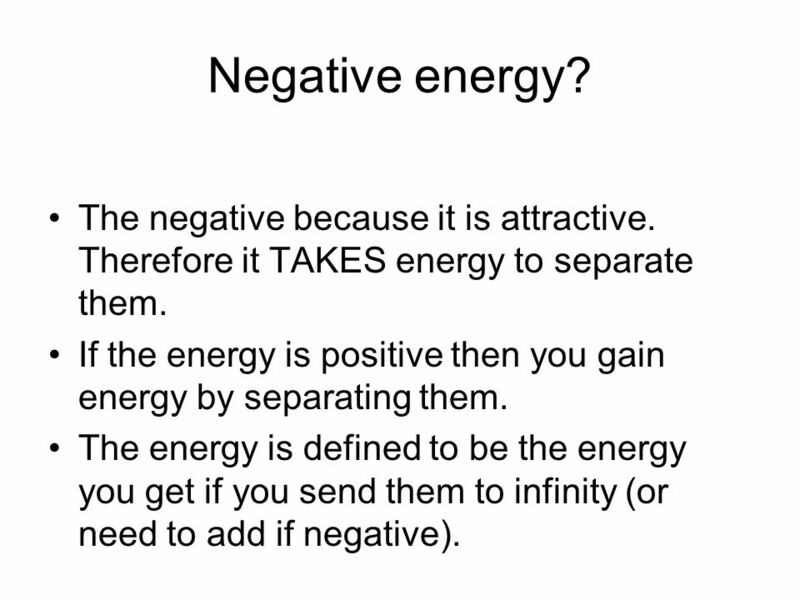 If the energy is positive then you gain energy by separating them. The energy is defined to be the energy you get if you send them to infinity (or need to add if negative). 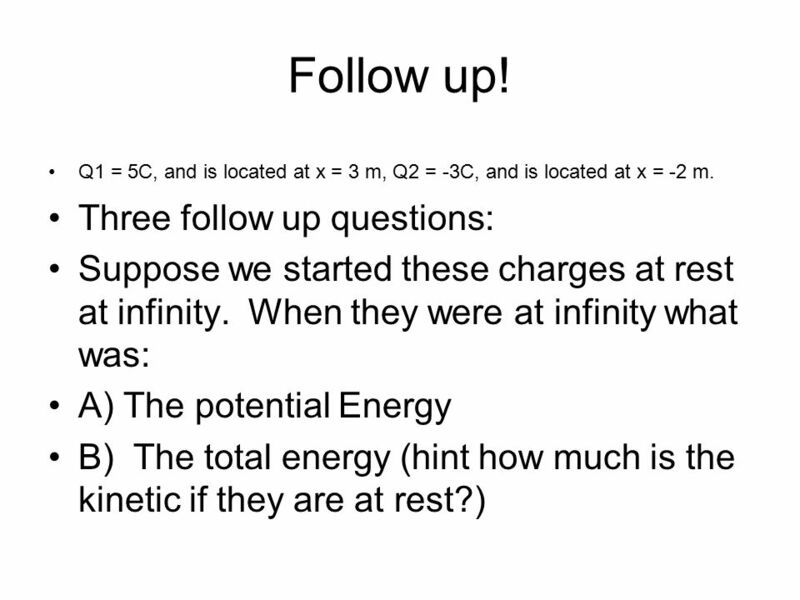 Q1 = 5C, and is located at x = 3 m, Q2 = -3C, and is located at x = -2 m. Three follow up questions: Suppose we started these charges at rest at infinity. Now we let them go until they reach the position above A) What is the total energy when they reach their locations? 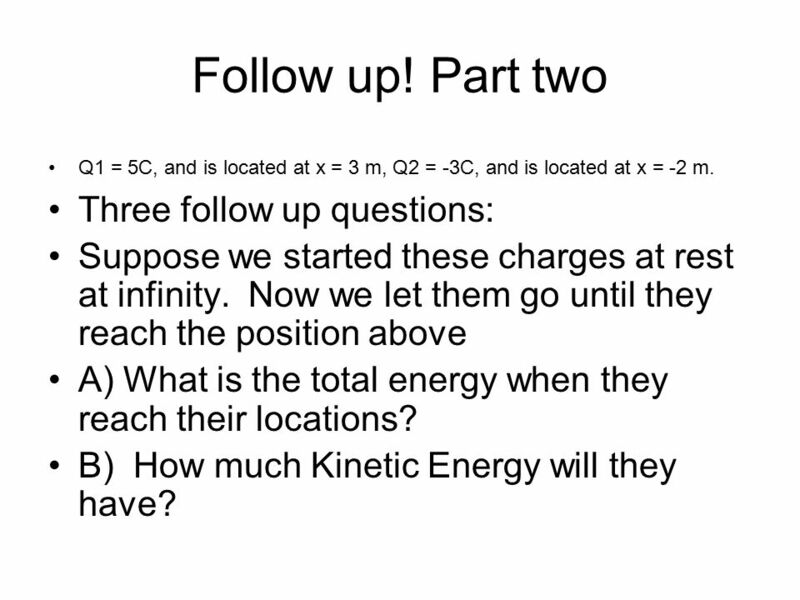 B) How much Kinetic Energy will they have? Suppose there are > 2 charges! The total potential energy is the sums of the potentials for each pair. 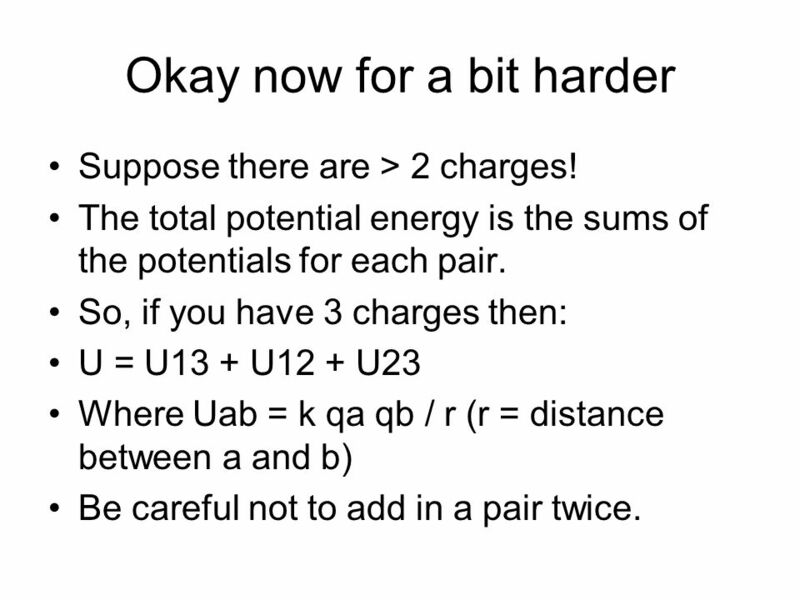 So, if you have 3 charges then: U = U13 + U12 + U23 Where Uab = k qa qb / r (r = distance between a and b) Be careful not to add in a pair twice. 9 3 charges in 1 dimension Calculate the total potential energy. 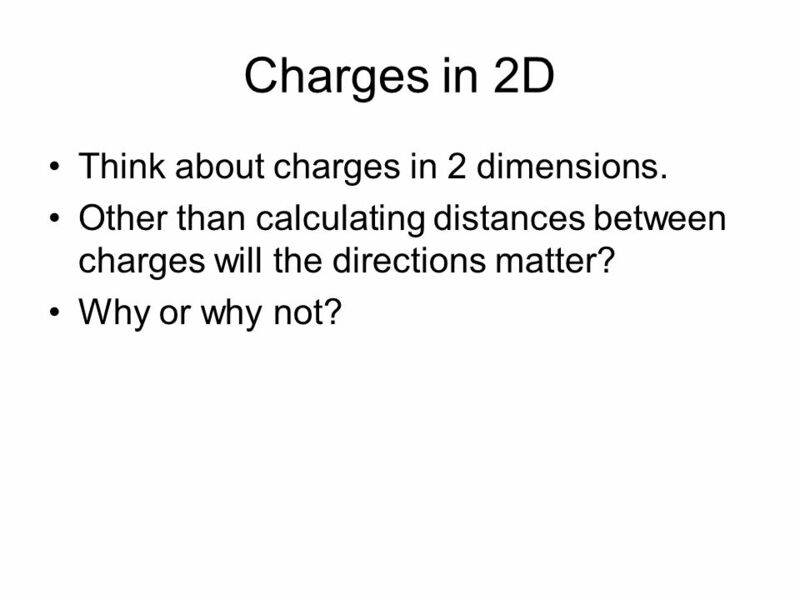 10 Charges in 2D Think about charges in 2 dimensions. Other than calculating distances between charges will the directions matter? Why or why not? 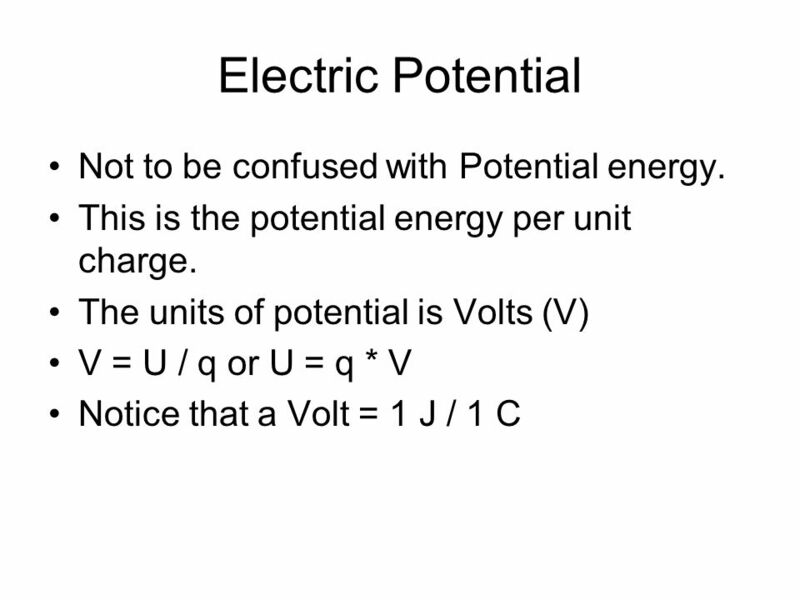 11 Electric Potential Not to be confused with Potential energy. 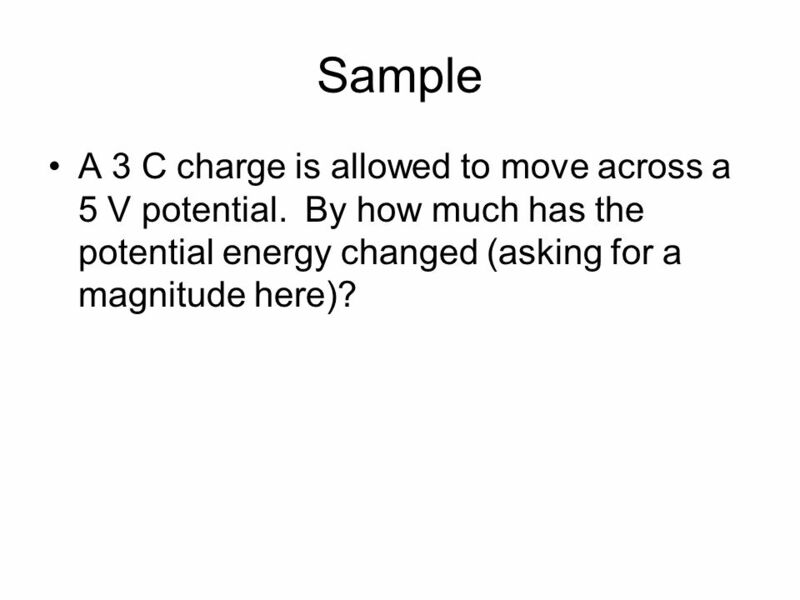 12 Sample A 3 C charge is allowed to move across a 5 V potential. By how much has the potential energy changed (asking for a magnitude here)? 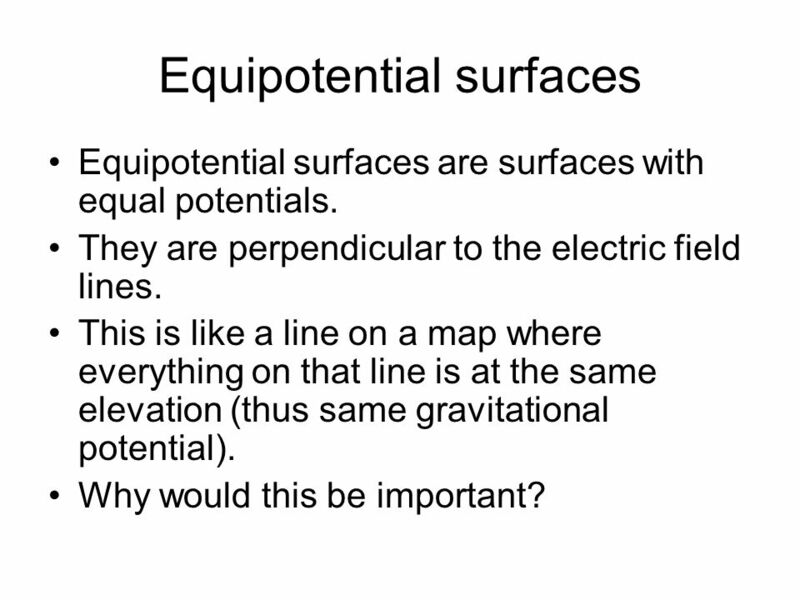 Equipotential surfaces are surfaces with equal potentials. They are perpendicular to the electric field lines. This is like a line on a map where everything on that line is at the same elevation (thus same gravitational potential). Why would this be important? 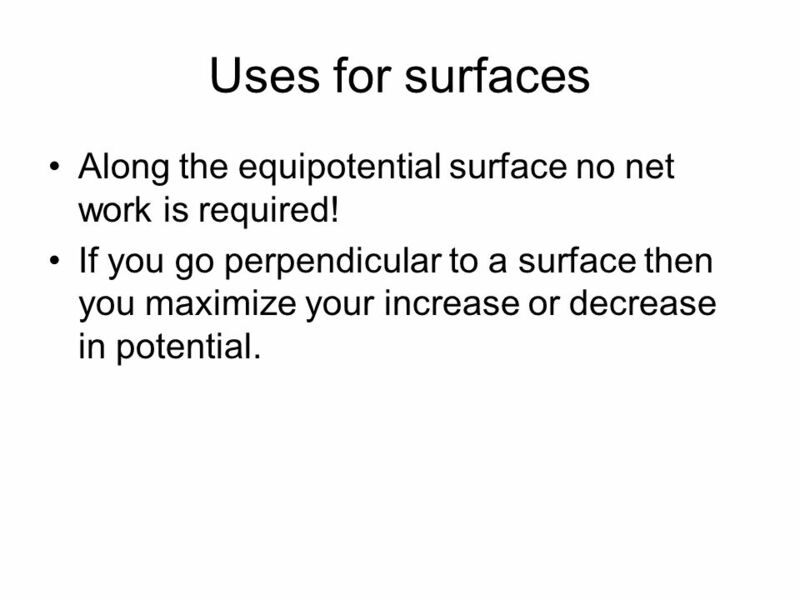 14 Uses for surfaces Along the equipotential surface no net work is required! If you go perpendicular to a surface then you maximize your increase or decrease in potential. A charge of 5C is located inside a constant electric field of 7 V/m. 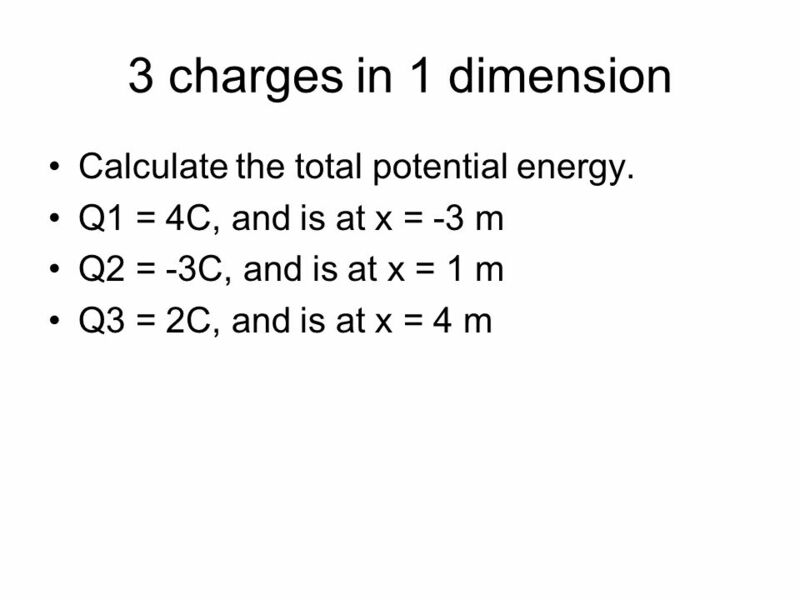 What is the change in potential for the charge if the charge move 3 m. What is the change in potential energy for the charge (no it won’t be the same answer as for A)? 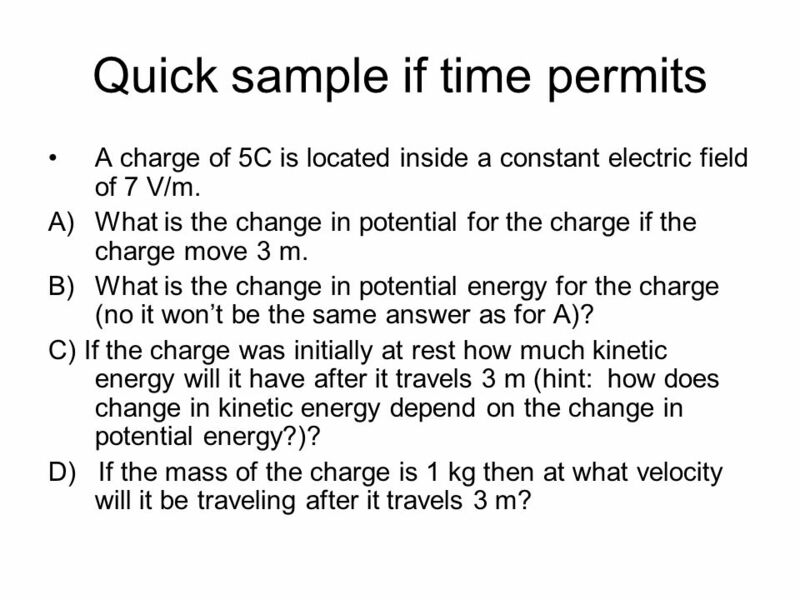 C) If the charge was initially at rest how much kinetic energy will it have after it travels 3 m (hint: how does change in kinetic energy depend on the change in potential energy?)? D) If the mass of the charge is 1 kg then at what velocity will it be traveling after it travels 3 m? 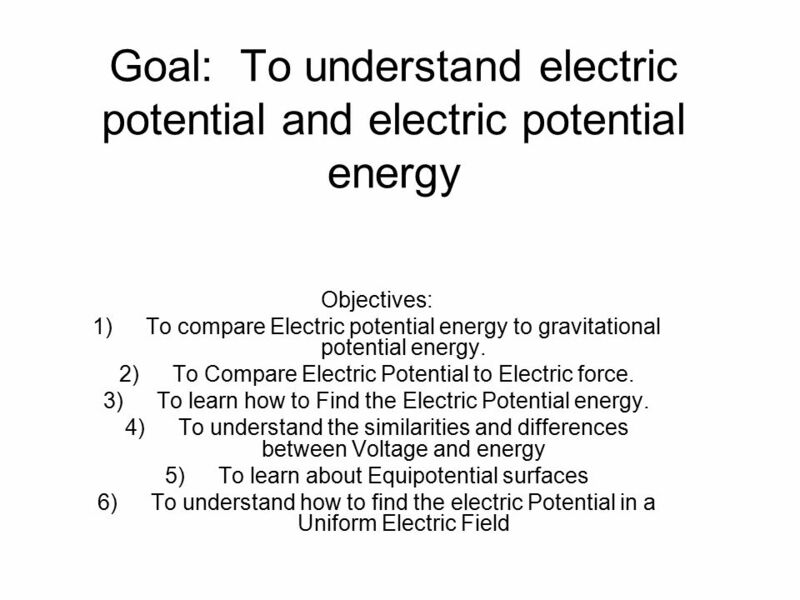 Download ppt "Goal: To understand electric potential and electric potential energy"
Ben Gurion University of the Negev Week 3. Electric potential. Electric Energy and Circuits. Electrostatic Equilibrium No net motion of charge is occurring within a conductor Meets the following conditions ▫Electric. 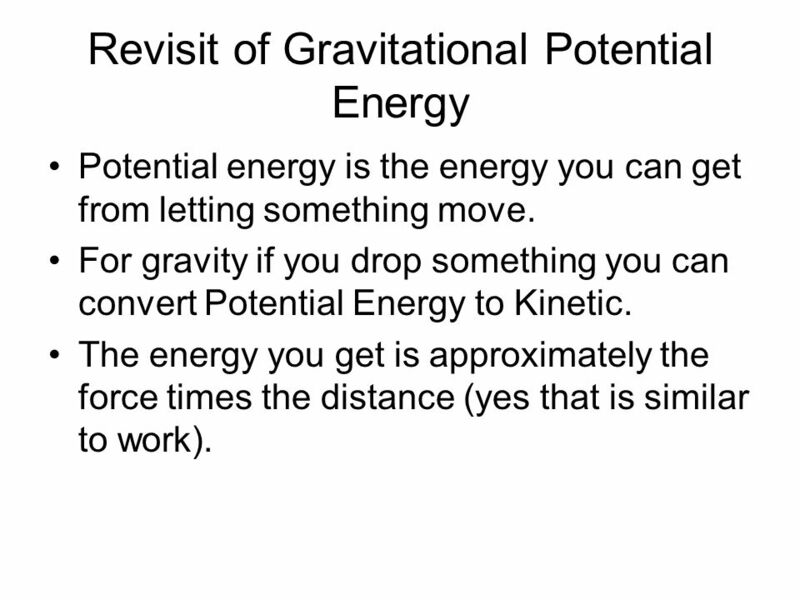 Electrical Energy and Electric Potential AP Physics C.
CH Review -- Gravitational Potential Energy and Gravitational Potential Earth If a ball is released from rest, it will move in the direction of. 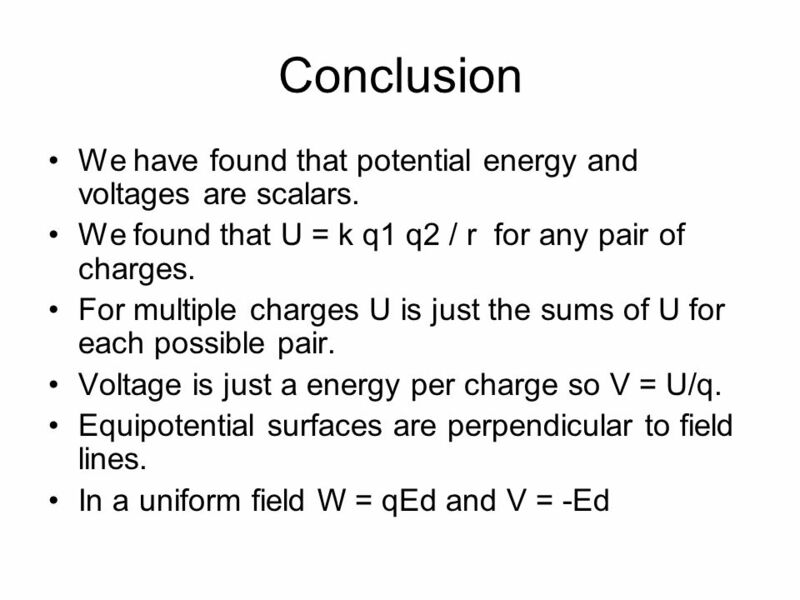 Goal: To understand Electrostatics Objectives: 1)Understanding what charges are. 2)Knowing how to produce a charge. 3)How to calculate an electric field. 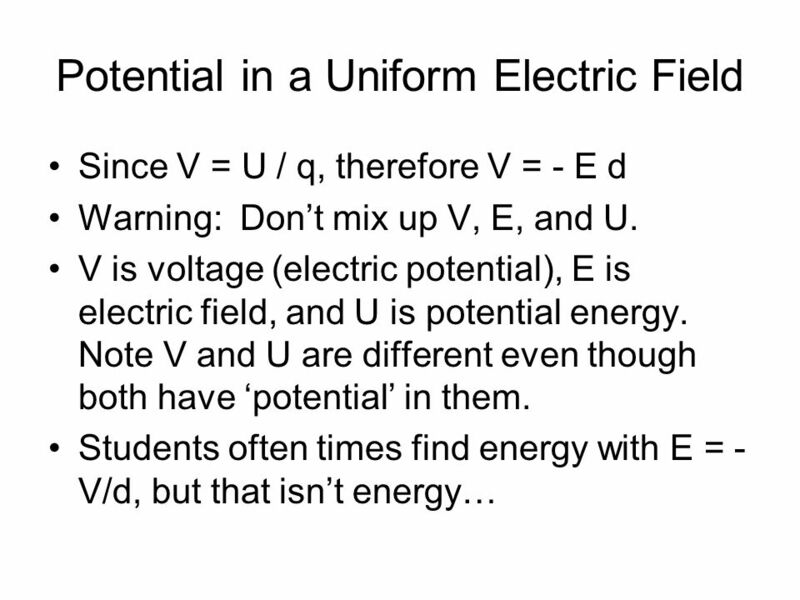 Electric Potential Physics 102 Professor Lee Carkner Lecture 12. Physics 6B Electric Potential and Electric Potential Energy Prepared by Vince Zaccone For Campus Learning Assistance Services at UCSB. Electric Potential Physics Department, New York City College of Technology. Copyright © 2009 Pearson Education, Inc. Lecture 4 – Electricity & Magnetism b. Electric Potential. Electrical Potential Energy Chapter Electrical Potential Energy Electrical Potential Energy – Potential energy associated with an object due to. 21.2 Applications of Electric Field If you do work to lift a ball against gravity the PE of the ball will increase. The same works with charges. How do.